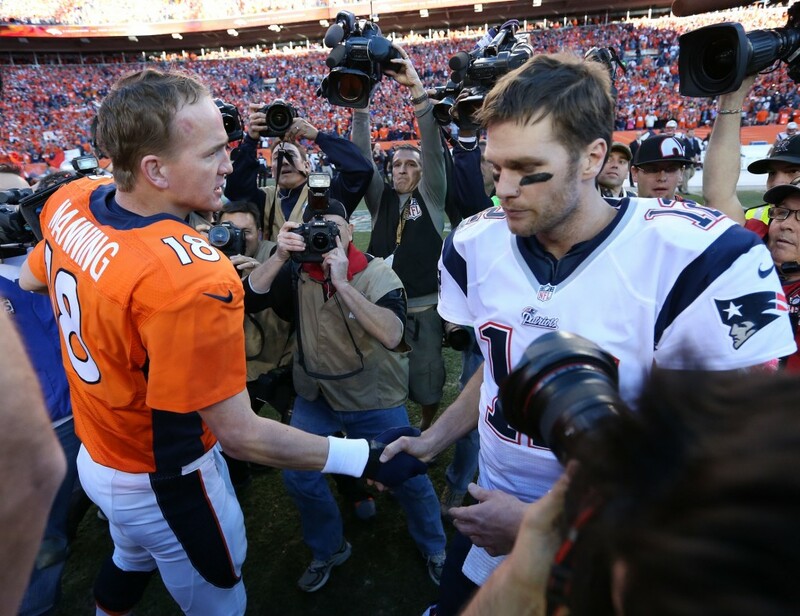 Brady Vs. Manning: Who’s the Best? With Peyton Manning surpassing the NFL’s most coveted record last Sunday, he solidified a spot on the prestigious (and non existent) Quarterback Mount Rushmore. Left up for debate are the three other illustrious QB’s that would join him…Brady, Elway, Marino, Montana, Unitas, etc? While that’s up for discussion, there is no debating who the most statistically decorated QB of all time is. And since we’re on debates, lets focus on the most prevalent one now: Tom Brady or Peyton Manning. Comparing Brady and Manning is like comparing a lion and a tiger. Both have killer instincts. Both are fierce predators in the jungle. Both are lethal to other animals. And both sit atop of the food chart. Hard to find a clear distinction. The most easiest and obvious way to solve this would be head to head victories. Of course, the one who has defeated the other more times should clearly illustrate who the best is, right? Wrong. In fact that only tells a small part of it. Before I disregard that, let me give Brady his props for defeating Manning 10 out of the 15 times they have played. Brady has owned Manning in their match ups. But how he won is the question? During the first 6 victories Brady has benefited from the Patriots strong running game and stingy defense that only allowed 19.3 pts a game. So in actuality, for the first six times they faced, Brady rarely had to truly carry the team on his back. To put things in perspective, through those same first six games, Brady only attempted 180 pass for 1,322 yards, while Manning attempted 234 for 1,540 yards. Obviously, Manning had more of the burden to carry his team. If we look at MVP awards, Manning has won an unprecedented five, while Brady has two. If we look at overall postseason record, Manning is 11-12, while Brady is 18-8. And if we look at the most important stat, Super Bowl Wins, Brady has the upper hand here; three victories to Manning’s one. However Brady was defeated in his last two trips to the Superbowl (interestingly enough by Peyton’s younger brother, Eli). The main thing that will hurt Manning’s argument and overall legacy is his losing postseason percentage. His last Superbowl was catastrophic and I’m sure he wishes he developed amnesia that fateful day. Apparently he missed the memo about the Legion of Boom. Brady, on the other hand, is a stud come off season. Though he 4-6 in his last 10 playoff appearances. While Brady is the clear winner when is comes to postseason wins, Manning is the winner when it comes to individual accolades and statistics. And Manning is often praised for his preparation and his impeccable audible calling on the line of scrimmage. Adam Vinatieri, care to weigh in?